Azure the cloud for all – highlights from Microsoft BUILD 2018 - In this final recap of Microsoft Build 2018, Julia White, Corporate Vice President, Microsoft Azure pulled together some key highlights and top sessions to watch. This post summarizes what's new across tools, containers+serverless, IoT, and Data+AI. “Hey! You! Get on my cloud.” Corey Sanders at Build 2018. Public preview: Query across applications in log alerts - You can use Azure Application Insights to monitor a distributed modern cloud application. In the same spirit, log alerts enable you to combine data across various apps. Cross-app query support in log alerts is currently in preview. Protect virtual machines across different subscriptions with Azure Security Center - Azure Security Center’s Cross-Subscription Workspace Selection enables you to collect and monitor data in one location from virtual machines that run in different workspaces, subscriptions, and run queries across them. Announcing SQL Advanced Threat Protection (ATP) and SQL Vulnerability Assessment general availability - SQL Vulnerability Assessment (VA) provides you a one-stop-shop to discover, track and remediate potential database vulnerabilities. It helps give you visibility into your security state, and includes actionable steps to investigate, manage and resolve security issues, and enhance your database fortifications. VA is available for Azure SQL Database customers as well as for on-premises SQL Server customers via SSMS. We're talkin' Azure Low Priority VMs - Corey Sanders, Corporate VP - Microsoft Azure Compute team sat down with Meagan McCrory, Senior PM on the Azure Compute Team to talk about the availability of Low Priority VMs. 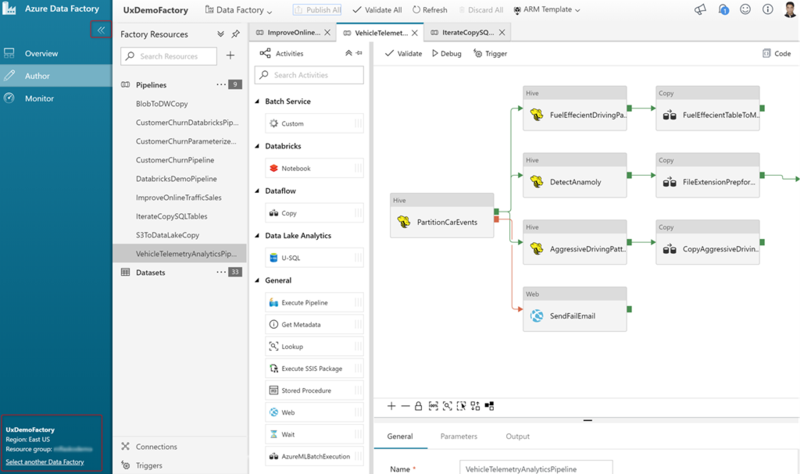 Enhance productivity using Azure Data Factory Visual Tools - Azure Data Factory (ADF) visual tools enable a rich, interactive visual authoring and monitoring experience to iteratively create, configure, test, deploy and monitor data integration pipelines without any friction. The main goal of the ADF visual tools is to allow you to be productive with ADF by getting pipelines up and running quickly without requiring to write a single line of code Read this post for the latest updates. Accelerate innovation with Consulting Services in Azure Marketplace - As announced at Build 2018, Azure customers can now easily maximize the potential of the intelligent cloud through newly released Azure Marketplace Consulting Services offerings. The new offer provides assessments, briefings, implementations, proof-of-concepts, and workshops by Microsoft partners with a Silver or Gold cloud competency. Azure Marketplace new offers: April 16-30 - The Azure Marketplace is the premier destination for all your software needs – certified and optimized to run on Azure. Find, try, purchase, and provision applications & services from hundreds of leading software providers. In the second half of April we published 15 new offers, including: Kubernetes Sandbox Certified by Bitnami and Forcepoint Next Generation Firewall. Using the Azure IoT Python SDK: make sure you check the version! - Azure IoT Python SDK is a wrapper on top of our Azure IoT C SDK, and we release binary packages on pip for Windows, Ubuntu, and Raspbian, all of which are compatible with Python 2 and Python 3. This post covers the ups and downs of this approach, and provides developers with guidance on how to use it. Help improve our Azure docs! - This post introduces a new experiment to Azure docs, code-named Aladdin, which is an AI assistant that connects you to relevant Azure documentation and helps you accomplish your work more efficiently. The Aladdin extension is available for Chrome and coming soon for Edge. 10 great things about Kafka on HDInsight - Dhruv Goel, Program Manager for Azure Big Data, provides his list of the 10 great things about Kafka on HDInsight (Microsoft Azure’s managed Kafka cluster offering), including its ease of use and scalability. 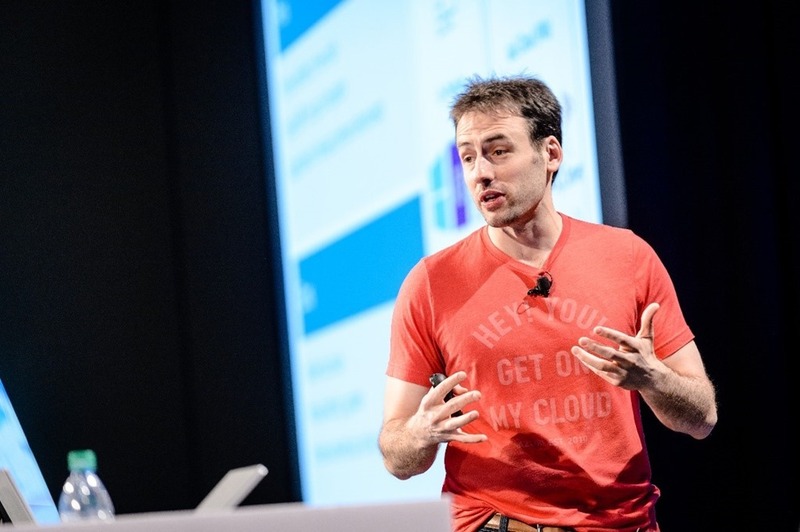 Why developers should enable Azure Security Center’s Just-in-Time VM Access - Learn how Azure Security Center’s Just-in-Time VM Access can help you secure virtual machines that are running your applications and code. Just-in-Time VM Access is a part of Security Center’s Standard Tier, which is free for the first 60 days. Detect malicious activity using Azure Security Center and Azure Log Analytics - Investigating malicious activity on their systems can be tedious and knowing where to start is challenging. Azure Security Center makes it simple for you to respond to detected threats. Learn how Security Center’s ability to detect threats using machine learning and Azure Log Analytics can help you keep pace with rapidly evolving cyberattacks. Accelerate your cloud data warehouse with automation tools - Data warehouse automation (DWA) tools bring the benefits of meta-data driven automation, and code generation to streamline developing and managing a data warehouse solution. Learn which data warehouse automation partners have certified their tools with SQL DW, and read what customers have to say about data warehouse automation tools. New Azure Network Watcher integrations and Network Security Group Flow Logging updates - Azure Network Watcher provides you the ability to monitor, diagnose, and gain insights into your network in Azure. This post highlights two of the most recent partners who offer tools that seamlessly integrate and understand your network in Azure: McAfee and NSG. The Azure Podcast: Episode 229 - Live from Build with Jessica Deen - On Day 2 of Build 2018, the crew chats with Jessica Deen, Cloud Developer Advocate, about VSTS and Kubernetes. Join Microsoft at Bio-IT World - Last week, Microsoft sponsored the Bio-IT World Conference and Expo in Boston. Learn about research and product development being Microsoft is doing in the life sciences and healthcare industries. The IoT Show | IoT Projects by the Azure CAT E2E team - There is a team within Azure working closely with customers on special projects, integrating latest Azure technologies. The IoT Show got the chance to visit their lair just before Build to get a sneak peek at some of the demos they were preparing for the event. Drones, Azure IoT, Machine Learning on the edge and lots of fun!. The IoT Show | A tour of the IoT booth at Build 2018 - The IoT Show was live on the IoT booth at Build 2018. You can re-live the tour of the demos on demand and check out all the cool demos the various IoT teams put together. The IoT Show | Azure IoT Central and Devices - Marcello Majonchi joined Olivier on the IoT Show to discuss some of his cool project using Azure IoT Central and a set of development boards such as the ElectricImp, the MXChip DevKit, or Raspberry Pi. Build 2018 playlist: IoT apps in the cloud or on the edge - Connecting devices to the cloud can generate new business opportunities. Predictive maintenance can save costs and improve customer satisfaction. Tracking shipments and optimizing routes can improve efficiency. Remotely managing healthcare equipment can provide better care and save costs. The possibilities with IoT are endless. Microsoft provides the most comprehensive IoT portfolio that enables you to build the solutions of tomorrow using your existing skills. Choose from SaaS and PaaS offerings and extend your IoT application to the intelligent edge and to Microsoft proprietary hardware. Build 2018 playlist: Migrate existing apps to the cloud - Microsoft Azure can bring you incredible value. From enhanced security to reduced hands-on server maintenance to increased application availability and reduced costs. To benefit from this value, migrate your existing infrastructure, platform, services, and applications to the cloud. Microsoft provides tools, options, and guidance to help you migrate and modernize your applications over time, in a way that suits your business needs. Build 2018 playlist: Extend existing apps with cloud services - Whether you have desktop, web or mobile applications, Microsoft can help you to enhance them by providing intelligent services and features that can make your application smarter, more reliable, scalable and more cost-efficient. Features like cognitive services add easy-to-consume intelligence, Application Insights provide advanced application monitoring, and App Service makes your app scalable and deployable with no downtime. Use these and other services by just bolting them on. AI Toolkit for Azure IoT Edge - This toolkit shows you how to package deep learning models in Azure IoT Edge-compatible Docker containers and expose those models as REST APIs. We've included examples to help get you started, but the possibilities are endless. We'll be adding new examples and tools often. The models can be used as-is or and customized to better meet your specific needs and use cases. Kubernetes virtual kubelet provider for managing Azure IoT Edge deployments - Azure IoT Edge Connector leverages the Virtual Kubelet project to provide a virtual Kubernetes node backed by an Azure IoT hub. It translates a Kubernetes pod specification to an IoT Edge Deployment and submits it to the backing IoT hub. The edge deployment contains a device selector query that controls which subset of edge devices the deployment will be applied to. Tutorial: Explore the capabilities of the remote monitoring solution accelerator - This tutorial shows you the key capabilities of the remote monitoring solution. To introduce these capabilities, the tutorial showcases common customer scenarios using a simulated IoT application for a company called Contoso. The tutorial helps you understand the typical IoT scenarios the remote monitoring solution provides out-of-the-box. AI Show | Conversational AI and Authentication - Connecting your bot to resources like the Microsoft Graph API, LinkedIn, or Uber can be challenging. In this video, learn about the newly built-in authentication cards supported in Azure Bot Service, enabling your bot to authenticate users against a wide variety of auth providers and perform tasks on their behalf. AI Show | Conversational AI: Bot Building Tools - Watch to learn about the latest bot building tools that are AI services aware, and support end-to-end bot development workflow to create, build, test, deploy and manage your bot. The tools we provide include a set of rich command line tools that help you create and manage bots and channel registrations, and manage AI connected services. We will showcase how different tools assist you in different stages of the bot development process, helping you with conversational modelling, LUIS, QnA maker and language model dispatching. We will also give a sneak peak of the new and extensible bot emulator, which allows management of bots, connected services and transcripts. All the tools and the emulator are open source – visit our GitHub repos and clone, contribute, comment and be a part of creating great bot tools!